Blockchain is poised to reshape nearly every industry as companies work to increase security and anonymity, drive efficiencies, lower costs, and more. In fact, Gartner forecasts the market opportunity for blockchain to exceed $3.1 trillion between now and 2030, creating considerable demand for blockchain talent. But we don’t just need technical developers who can help build this technology — it’s also crucial that business professionals understand the fundamentals of blockchain and its applications. This applies to executive levels as well as operational roles within an organization. Today, we’re excited to partner with INSEAD, one of the world’s top business schools to launch ‘Blockchain Revolution for the Enterprise,’ a new Specialization taught by Don Tapscott, adjunct professor at INSEAD and co-founder of the Blockchain Research Institute (BRI). Tapscott is one of the world’s leading authorities on blockchain and the role technology plays in business and society. With content derived from the BRI’s multi-million dollar research program, the four-course Specialization is designed to introduce business professionals to the world of blockchain and teach them how to strategically leverage the technology to create scalable business opportunities. 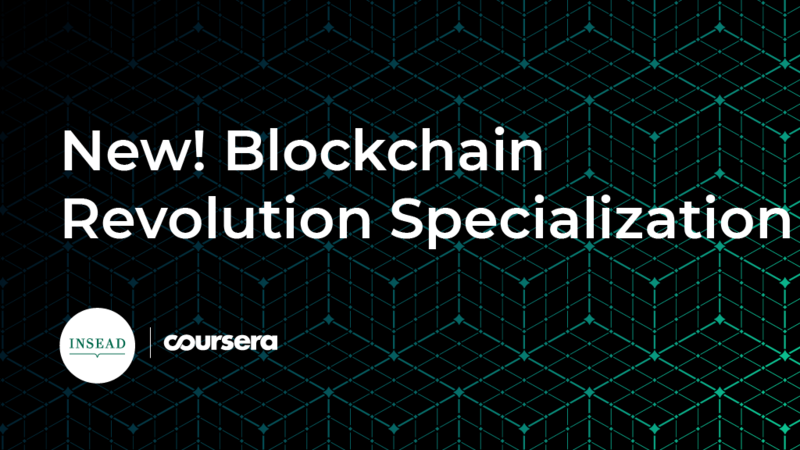 The first course in the Blockchain Revolution for the Enterprise Specialization is available today, with additional courses rolling out through next week. Coursera and INSEAD will also be launching a number of vertical-focused Specializations that adapt this content for specific application in industries like healthcare, finance, and supply chain. As blockchain presents another wave of technological disruption, we believe learners need flexible, affordable ways to keep up. We are humbled to collaborate with industry leaders like Don Tapscott and INSEAD to provide an accessible pathway that empowers learners with skills that can transform their careers and their businesses.